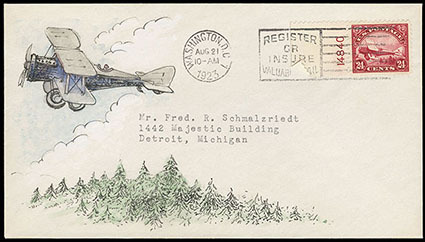 Airmail, 1923, Second Issue, 8¢-24¢ complete, each on matching Henry Hammelman First Day Covers, tied by Washington, D.C. slogan machine postmarks; 8¢ cover with minor light toning at bottom left, a Very Fine matched set. 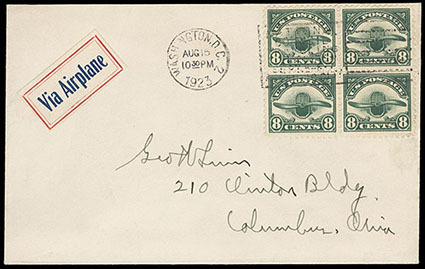 Airmail, 1923, 8¢ dark green, block of four, tied by "Washington, D.C., Aug 15, 1923" First Day slogan machine cancel on cover to George Linn, backflap with "The Shoreham, Washington" imprint, Very Fine, a scarce early Linn cover. Scott No. C4; $600 Estimate $200 - 300. 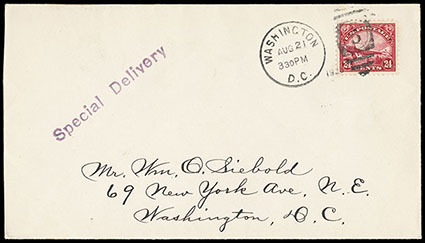 Airmail, 1923, 16¢ dark blue, tied by "Washington D.C., Aug 17, 1923" First Day slogan machine cancel on cover with beautiful multicolor hand-painted cachet (post-issue), fresh and Extremely Fine, first day uncacheted cat. $600. Scott No. C5 Estimate $400 - 600. 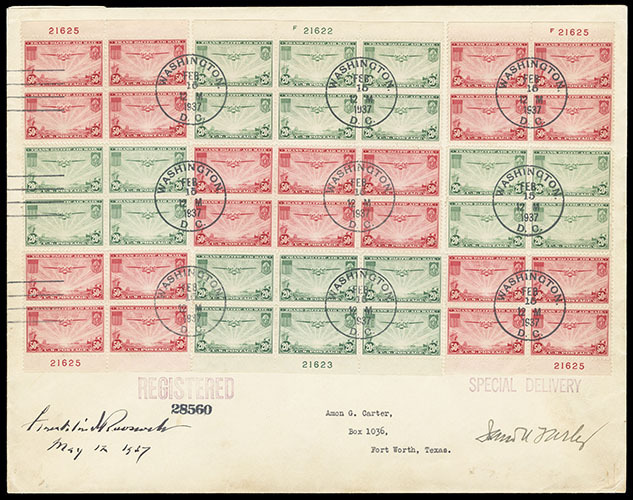 Airmail, 1923, 24¢ carmine, plate no single tied by "Washington D.C., Aug 21, 1923" First Day slogan machine cancel on cover with gorgeous multicolor hand-painted cachet (post-issue), fresh and Extremely Fine, First Day uncacheted cat. $750. Scott No. C6 Estimate $500 - 750. 1930 Salt Lake City, Utah to San Diego, Cal., cover with purple "Damaged by Air Plane Wreck, December 22, 1930" handstamp; the plane (CAM 4) developed engine trouble and crashed in Alhambra, Cal., Very Fine. AAMC No. 301222 Estimate $100 - 150. 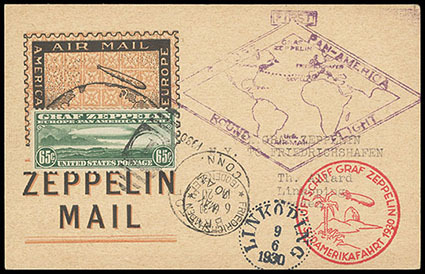 Airmail, 1930, 65¢ Graf Zeppelin, tied by "Bristol, Conn. May 31, 1930" duplex on Zeppelin Mail cachet post card to Linkoping, Sweden, purple U.S. diamond and pink red German circular flight cachet handstamps, Friedrichshafen (6.6) transit and Linkoping (6.9) arrival cds, Very Fine. 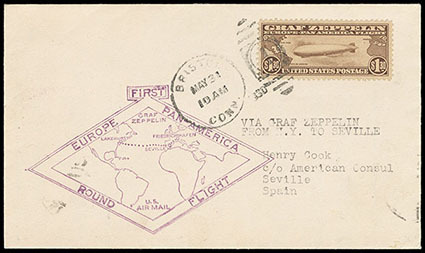 Airmail, 1930, $1.30 Graf Zeppelin, well centered, tied by "Bristol Conn., May 31, 1930" duplex to Seville, Spain, purple diamond flight cachet, reverse with Sevilla (6.6) arrival backstamp, Very Fine. Scott No. C14 Estimate $150 - 200. 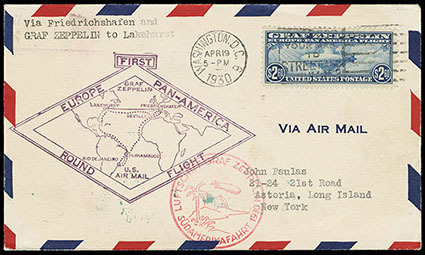 Airmail, 1930, $2.60 Graf Zeppelin, tied by "Washington D.C., Apr 19, 1930" First Day of Issue slogan machine cancel on 1930 South American flight cover, appropriate U.S. and German flight cachets, green round flight backstamp, Very Fine and choice. Scott No. C15; $1,000 Estimate $500 - 750. 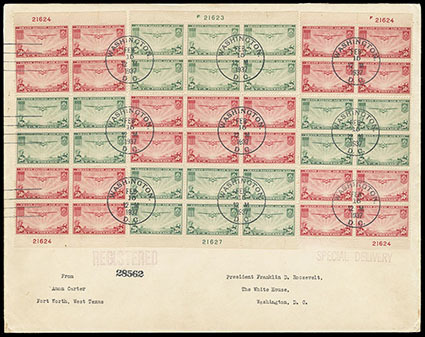 Airmail, 1937, 20¢ & 50¢ China Clipper, twenty 20¢ and twenty two 50¢ issues in blocks of four or six each bearing plate numbers, all tied by "Washington D.C., Feb 15, 1937" cds's on oversized registered special delivery First Day Cover from Amon Carter in Fort Worth, Texas to President Franklin D. Roosevelt at the White House, with second similar oversized registered special delivery First Day Cover addressed to Amon Carter and signed by President Franklin D. Roosevelt and Postmaster General James Farley, with blocks on each cover bearing different plate numbers, Extremely Fine. Scott No. C21-C22 Estimate $1,000 - 1,500. 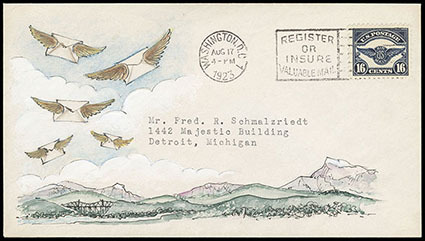 A MARVELOUS DELUXE SET OF CHINA CLIPPER ISSUE FIRST DAY COVERS SIGNED BY PRESIDENT FRANKLIN D. ROOSEVELT AND POSTMASTER GENERAL JAMES FARLEY. Amon G. Carter Sr. was the creator and publisher of the Fort Worth Star-Telegram, and a nationally known civic booster for Fort Worth, Texas. 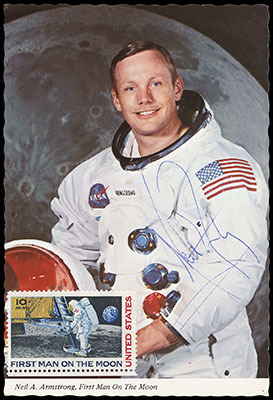 Airmail, 1969, 10¢ Moon Landing, on signed Neil A. Armstrong picture postcard, Very Fine. Scott No. C76 Estimate $150 - 200.